World Youth Alliance | WYANA Concludes Spring 2018 ELC Tour! WYANA Concludes Spring 2018 ELC Tour! Hillsdale, MI – On February 16-17, an Emerging Leaders Conference (ELC), with the theme of The Modern Identity Crisis, was held on the campus of Hillsdale College. 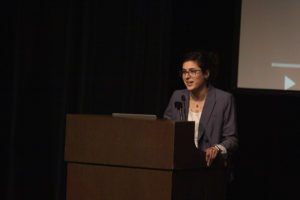 Nearly 200 attended the event, co-hosted by the World Youth Alliance, the Hillsdale College Department of Philosophy and Religion, the Intercollegiate Studies Institute and seven other campus organizations. This ELC was Hillsdale’s first bioethics conference and was organized by four undergraduate science and humanities students. 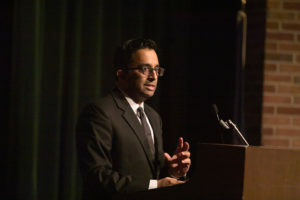 On Saturday, breakout session themes addressed the diverse interests of the student body ranging from artificial intelligence, the right to life versus the good life, and to the philosophical appraisal of personhood. Seven Hillsdale faculty from the departments of philosophy and religion, history, and politics, led the 30-minute breakout sessions, which led to engaging discussions between faculty and students. On behalf of World Youth Alliance, Julia Kenney, North America Director of Operations, delivered lectures on the WYA Human Dignity Curriculum and Fertility Education & Medical Management (FEMM) program. Students learned about the vision and impact of WYA in defending an authentic understanding of human dignity and WYA’s presence internationally. The ELC at Hillsdale, MI, concluded a successful school year of travel for the North American team, whose attention now turns to the International Summer Camp (ISC) as well as ELCs to be hosted during the 2018-2019 school year.